The NSW Parliament recently passed the Retail Leases Amendment (Review) Bill 2016 (“the Bill”) which has achieved royal assent and is expected to commence shortly. 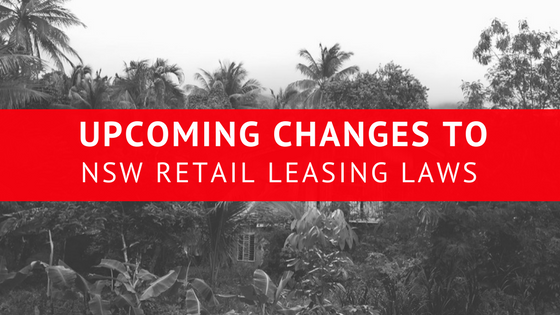 The Bill introduces reforms to the Retail Leases Act 1994 (“the Act”) that governs NSW retail shop leases. The requirement for a minimum lease term of 5 years will be removed. Leases with a term of more than 3 years will need to be registered. The lease will need to be lodged within 3 months after it is signed. Landlords will have stricter disclosure obligations for outgoings contributions. A tenant will not have to pay an outgoing if it is not disclosed in the landlord’s disclosure statement. If a premises is used wholly for non-retail purposes then it will be excluded from the Act. This includes ATMs, vending machines, public telephones, children’s rides, internet booths, private post boxes and certain storage uses. If a tenant exercises its right to terminate the lease during the first 6 months due to the landlord’s failure to give a disclosure statement or due to a defective disclosure statement, the tenant can recover compensation from the landlord. This includes the reasonable costs of entering into the lease and fitout costs. Tenants will not be liable to pay the costs of the landlord obtaining mortgagee consent to the lease. Enter your details below to get in touch with a legal professional and find out how Rouse Lawyers can help. "We have no hesitation in recommending the firm"
"It's hard to find good lawyer that understands a "tech" business - Rouse Lawyers are that firm…"